Advances in automation, artificial intelligence and robotics are coming - fast and furiously. These advances will result in job losses as businesses in many countries incorporate artificial intelligence and/or robotics into their operations to cut costs and improve efficiencies. Some refer to this economic shift as the fourth industrial revolution. 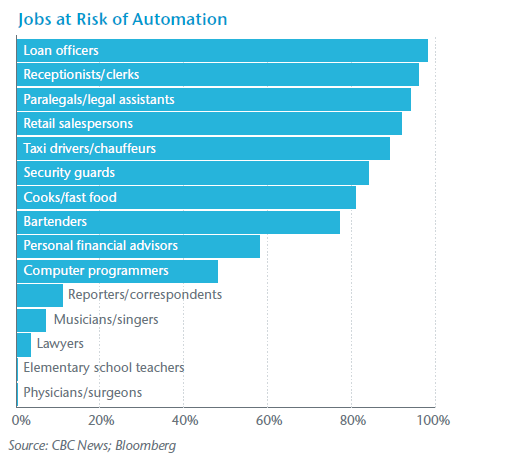 A January 2017 report by McKinsey & Company found that 45% - 47% of job activities in the U.S. could already be automated “by adopting currently demonstrated technologies.”9 The report also states that automation could be particularly high in certain sectors (see chart). In the automotive and automobiles sector, over 60% of salaried workers in Indonesia and 73% in Thailand face a high risk from robotic automation. In the electrical and electronics sector, over 60% of salaried workers in Indonesia, the Philippines, Thailand and Vietnam were at high risk from robotic automation. 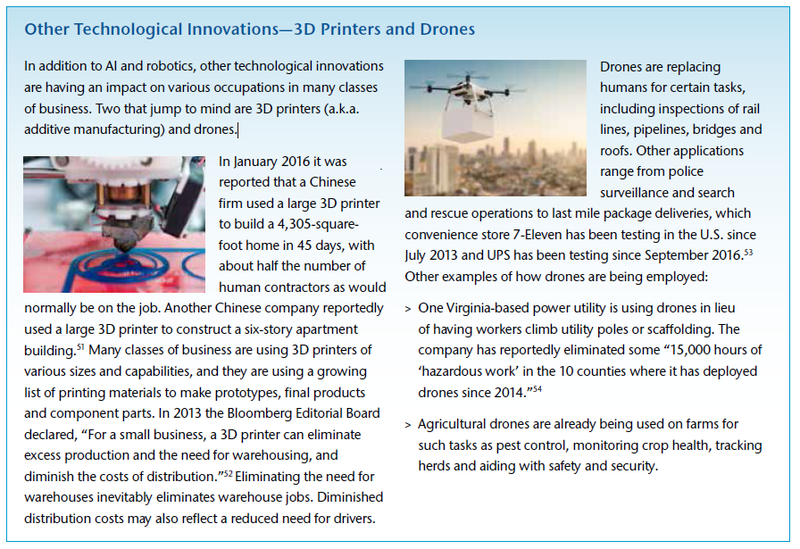 In the textile, clothing and footwear sectors, 88% of workers in Cambodia, 86% of workers in Vietnam and 64% in Indonesia face job disruption due to body-scanning tech and 3D printing. According to a March 2017 report entitled, “Robots and Jobs: Evidence from U.S. Labor Markets” by the National Bureau of Economic Research, from 1990-2007 each robot added to the U.S. workplace led to 6.2 job losses.15 It’s important to note that the robotics looked at by this study may reflect the impact of earlier, less sophisticated robotics. The AI and robotics being deployed in 2017 may actually replace a greater number of workers than what’s reflected in this study. Mining firms already employ driverless earthmovers and heavy driverless trucks. Several companies (e.g., Caterpillar, Komatsu) are now selling driverless bulldozers. A host of demolition robots is now available that can replace human contractors in some of the most dangerous work conditions. A Chinese maker of smart metering and smart power distribution equipment has installed robotics, resulting in a 45% improvement in productivity and a 25% decrease in operational costs. Workers who were previously on the assembly line were retrained for other “value-added positions.”35 In addition, the product defect rate dropped by over 50%. Certain white collar jobs will also be affected by the adoption of AI and robotics. Automation is already being used in some enterprises to write certain news/sports stories and sift through legal documents many times faster than paralegals. Scientists and doctors are also using AI to read X-rays, “analyze gene mutations, make better use of scientific studies, and enhance doctors’ clinical knowledge beyond their firsthand experience.”39 AI is also being used to identify diabetic retinopathy in patients and study traumatic brain injuries. As some robotics aren’t cheap, property values for farms and other enterprises adopting robotics will increase as they purchase expensive robotic equipment (as shown above) to replace workers. That said, as we’ve seen, the cost of new technology tends to drop quickly. Think flat screen TVs, which used to sell for thousands of dollars and which you can now purchase for about $142, or the Lidar that is going into driverless vehicles that used to cost $75,000 and is soon expected to cost less than $100. As automation reduces the number of contractors at various job sites, will rating via payroll still adequately reflect the exposure? With fewer workers, maybe fewer occupational injuries will impact Workers’ Compensation results, but there will also be less premium volume. As robotics are perhaps still best at repetitive tasks, will employers see less repetitive stress-type injuries but perhaps more injuries arising from people working in close proximity to mobile robotics? With automation increasing productivity, will Business Interruption claims and costs potentially increase? What about product liability arising from robots gone awry? Many companies’ manufacturing robots are not domiciled in the U.S. China is pushing to become the largest producer of robotics.43 Thus product liability may lie with the importers, which are often the companies adopting the robots. Manufacturing of robots could yet become a growing class of business in the U.S. Time will tell. Given the current cost of AI and robotics, it could be that larger firms (e.g., large contracting firms, corporate farms, large distribution centers) will be among the early adopters of this technology, but innovation will trickle down to smaller enterprises. Will those who don’t or can’t automate be undercut by those that do not have to pay for the salaries, benefits, taxes, etc. associated with human employees? Will this same scenario translate to the Property/Casualty industry, where insurers providing coverage for larger risks may see the impacts of AI and/or robotics first, and where smaller carriers may perhaps have more time to adjust? Carrier Management reported that a Japanese insurance company has recently replaced 34 positions - roughly 30% of its claims staff - with artificial intelligence to “make the process of reading medical certificates more efficient.”45 The staff cuts are expected to save the company $1.2 million per year. In the UK, Zurich Group has a project underway that uses artificial intelligence to review medical reports for evaluating personal injury claims. This has reportedly reduced the review time for 10- 100 page documents from 58 minutes all the way down to five seconds. “This one project is expected to free up 39,000 hours of claim handler capacity per year, saving $5 million annually.”46 Based on an eight-hour day, that’s a savings of 4,875 days per year. Doesn’t that sound like Zurich may be able to reduce staff? 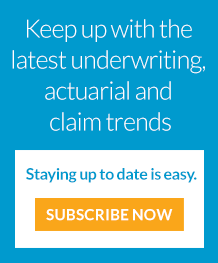 On a more positive note for underwriters, as artificial intelligence begins to take on such tasks as the gathering of customer or product information and verifying the accuracy of records and perhaps insurance applications, underwriters will be freed to spend more time on other aspects of their job. On the one hand, MIT economist Andrew McAfee warns that “Anyone making confident predictions about anything having to do with the future of artificial intelligence is either kidding you or kidding themselves.”50 However, given the breadth and potential pace of change, commercial carriers may wish to give these coming changes some thought. Will AI and/or robotics improve risk? Shift risk? In which lines, and for which classes? Will premium potentially increase or decrease? If so, for which classes? At Gen Re we are preparing for the economic shift brought about by robotics and artificial intelligence. This will impact book composition, and we are monitoring those classes of business that might be impacted first. Contact us if you have questions about this, or any of the other emerging exposures that may impact the Property/Casualty insurance sector.